Can these be used for welcome bags or two big? I like it a lot. The bag itself is a great gift. Depends on what you plan on putting in it. If you are just putting a few things in it that will barely cover the bottom of the bag, then it will look too big. I also agree that the bag itself seems appropriate, but it depends on what you intend to fill it with. If it's going to look full, then yes, I would say it's fine. If it's not quite full, you can always use tissue or parchment style paper to fill the top space. (I wouldn't have them less than 1/2 full, or with space for items to shift around). I would not keep that bag, I feel like that's a significant expenditure that if you're on a budget, you may want to rethink. If this wedding was in my hometown, that bag would be at Goodwill by Monday or I'd try to find some kid running around at the wedding to pass it off on. If it's a destination wedding, I might not have enough space in my luggage to bring it home and wouldn't want to expend the effort repacking to make it fit. I'm sure it's well-intentioned, but most people have a ton of reusable shopping bags and totes. There are very few totes and purses that I'm willing to carry for aesthetic reasons. I'd much rather have a nice note waiting at my hotel, or a note with something like a bottle of wine or fruit/cheese plate. That makes me feel more welcome that more useless crap. 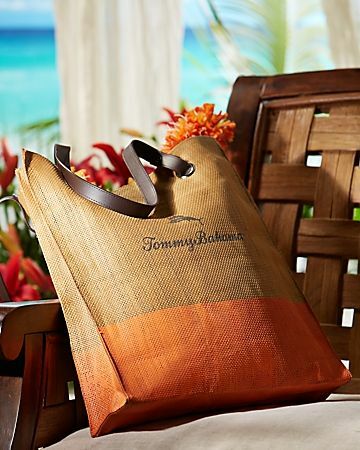 Yeah, I would not ever carry around or use a Tommy Bahama tote. And those totes aren't exactly cheap if I remember too - if I was your guest, I'd much rather have upgrades at the reception than a tote. I also agree that this bag will look odd if you just shove some water, crackers, and brochures into it. I think you'd be better off getting disposable bags with nicer items inside than these.